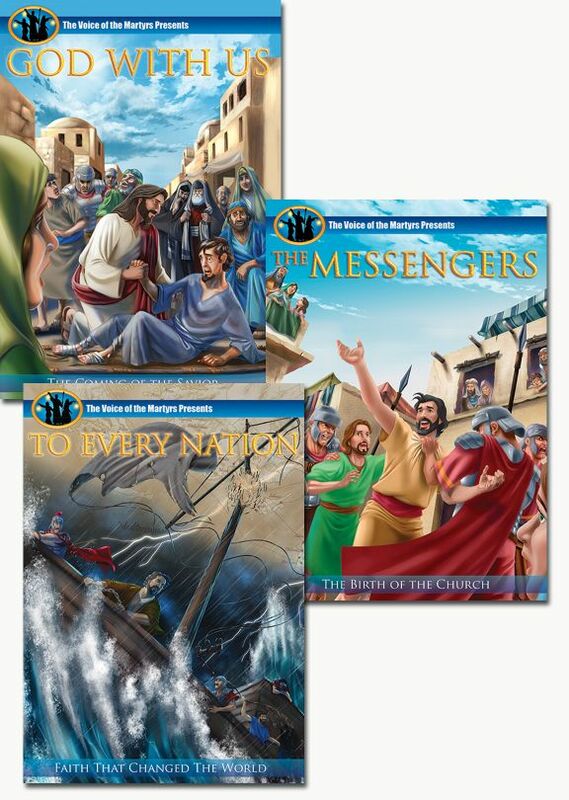 This set includes God With Us, The Messengers, and To Every Nation. God with Us — He was born in humble obscurity, yet His family had to flee to save Him from a jealous ruler. He forgave sins, healed the sick and gave hope to the downhearted and oppressed, yet He was despised and rejected by many. He spoke the truth even when it was dangerous to do so. He willingly laid down His life and then rose again, conquering the power of death! From The Voice of the Martyrs comes God with Us, formerly called Jesus: He Lived Among Us. With newly enhanced animation, it is the dramatic retelling of the life of Jesus Christ as seen through the eyes of the last surviving apostle, John. Journey with Jesus and encounter His miracles, His astonishing teaching and His unsurpassed bravery. Discover the power and love of Jesus Christ and see why His followers risked all to carry His message to the ends of the earth. Children and adults alike will be captivated by this account of Jesus’ life, featuring vivid storytelling and high impact animation. Recommended for ages 7 and up. This powerful presentation will encourage and inspire viewers to follow in the footsteps of Jesus Christ, the Son of God. Includes 16 audio tracks - English, Spanish, Turkish, Bosnian, Dutch, Arabic, Farsi, Russian, Mandarin, Cantonese, Korean, Hindi, Bangla (Muslim), Bangla (Traditional) and Urdu. Also includes 12 subtitle tracks - English, Spanish, Finnish, Albanian, Azerbaijani, Tartar, Georgian, Tajik, Ukrainian, Romanian, Croatian and Serbian. The Messengers — From The Voice of the Martyrs comes the sequel to God with Us: The Messengers—The Birth of the Church. Having risen from the dead, Jesus Christ has appeared to His disciples and instructed them saying, “Remain in Jerusalem until you are filled with power from Heaven!” Waiting in prayer as Jesus has commanded them, the time comes when the Holy Spirit is poured out upon them with great power and wonder! Follow the small band of early Christian believers as they boldly proclaim Christ and His message in the face of great opposition resulting in the growth of the church and the unexpected conversion of its most zealous enemy. Based on the Book of the Acts of the Apostles Chapters 1-9. People of all ages will be inspired by this powerful and moving depiction of the first Christians. Recommended for ages 7 and up. To Every Nation — To Every Nation is the third and final installment of The Witnesses Trilogy. In God With Us we witnessed the coming of Christ. In The Messengers, we witnessed the birth and empowering of the early church. Now, we witness the church’s miraculous growth and learn how the first believers took the gospel To Every Nation. Covering the Book of Acts chapter 10-28, this thrilling animated feature shows how the Christian faith changed the world. Recommended for children age 7 and up.